Standard Component - Every VTScada application includes an instantly intuitive Alarm management interface as well as pre-configured alarm and event databases. This integrated approach reduces configuration time and ensures that mission-critical alarm features remain tightly integrated over the life of your system no matter how many times you expand your application or update VTScada. ISA 18.2 Compliant - The re-imagined alarm page and augmented tools help you enact the best practices outlined in the ISA 18.2-2009 Alarm Management Standard. In the event of an alarm, simply click the blinking icon in the top right corner of every page to jump to the VTScada Alarm Page. See current, active, unacknowledged, and disabled alarms. Easily sort by date/time and filter by functional area or priority. Acknowledge, silence, or mute alarms even while configuring. Shelve alarms to stop alerts during maintenance and alarm floods. Print any range of the alarm or event history. Reduce eyestrain by choosing daytime and nighttime views. Adjust text and row size for optimal viewing on different screens. Access a time-stamped list of system events (e.g., logons or setpoint changes). Instantly identify the status and priority of each alarm in the list. Plot the associated tag’s data or open related displays. Use a combination of text, symbols, color, and sound to best meet the visual needs of your team (e.g., color vision deficiency). Provide context by adding encrypted operator notes to alarms. Require notes when acknowledging, shelving, or un-shelving alarms. ‘Alarm Details’ dialog provides an overview of each alarm’s configuration, history, and notes. Secure remote Thin Client access allows operators to manage alarms from anywhere using their own mobile devices. 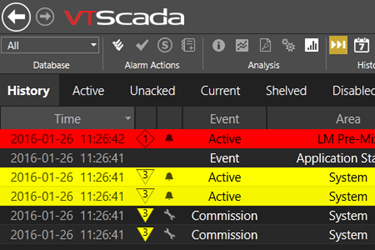 New VTScada Anywhere Client provides access to all advanced alarm analysis tools. Four new alarm reports help you to easily identify trouble spots in your physical system or the application’s configuration. Bad Actors Report – A ‘bad actor’ is an alarm that is tripped excessively indicating problems with equipment, processes, or alarm configuration. Easily spot bad actors by scanning alarm events within a specific period, sorted by the number of activations. Alarm Flood Report – An ‘alarm flood’ occurs when there are more alarm events in a specific period than operators can reasonably handle. Quickly identify floods by moving your mouse over the blue bars to see the number of alarms tripped within periods of time. Click a bar to zoom into that period. History Report - This pre-filtered list shows only Active and Trip alarm events. Select an alarm then use the tools in the Analysis Toolbar to gather more information about it. Distribution of Priorities – Easily compare your application’s alarm priority distribution with the ISA 18.2-2009 Alarms Management Standard. Compare the priority distribution for both your reported history and current configuration with the distribution recommended in the ISA 18.2-2009 standard. Configure multiple alarm databases to separate operational alarms (e.g., plants and processes) for targeted alarm processing. New VTScada applications include separate alarm and event databases. Existing applications are automatically converted. The Alarm Database Tag allows you to add more databases as required and synchronize them across a network. Filter the Alarm Page on any networked workstation to display lists from one or all of them. Locally stored databases allow operators to manage and modify alarms even when disconnected from alarm servers. Synchronized distributed databases keep your priceless alarm and event history safe and up-to-date. Areas of Responsibility - Define what information users can see in large applications. For example, if an application monitors two plants, operators may see and respond to alarms from their respective plants, while the management team can see alarms from both plants. In seconds, authorized developers can create alarms in the Alarm Tag Properties Dialog in the VTScada Tag Browser. To simplify the process further, Alarm Tags are built right into the Analog Status and Digital Status Tags. Developers can also embed customized alarm lists into any custom display using the VTScada Idea Studio. Configure pop-up dialogs to ensure that operators are aware of high priority alarms. Uninterrupted Alarm Management - VTScada’s online configuration allows you to view and acknowledge alarms even while editing application tags, screens, and properties. Tightly control access to the Alarm Page and Alarm properties using application-level privileges assigned to specific user accounts in their areas of responsibility. Users must log in with their own credentials to access alarm information via workstations, Thin Clients, and alarm notifications. Alarm privileges can be revoked instantly across the whole system. The optional VTScada Alarm Notification System ensures that your mission-critical alarm and process information can find you anywhere. Learn more. Optional VTScada Thin Clients allow authorized users to safely manage alarms from anywhere via mobile devices with HTML5 browser. Learn more.